On the eve of a possible Turkish counter-terrorism operation in Syria, Turkish President Recep Tayyip Erdogan and his U.S. counterpart Donald Trump on Friday agreed on the need for more effective coordination over Syria, said an official statement, Anadolu Agency reports. 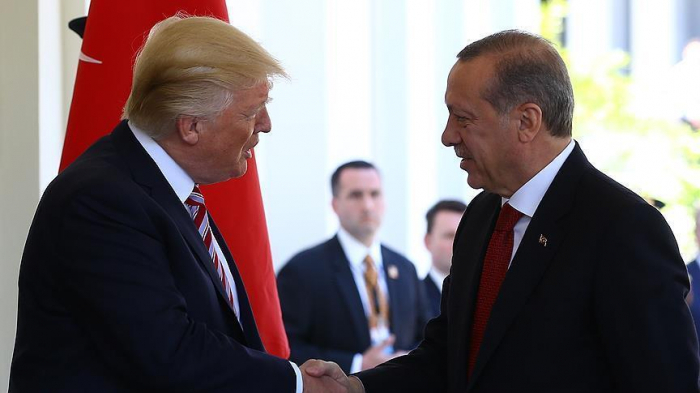 In a phone conversation late Friday, Erdogan and Trump discussed bilateral issues and recent developments in Syria, including security issues and counter-terrorism efforts, said the Turkish presidential statement. Erdogan told Trump about Turkey’s legitimate security concerns caused by the presence and actions in Syria of the terrorist organization PKK/PYD/YPG. Turkey has long decried U.S. cooperation with the PKK/PYD/YPG -- with Washington calling them "allies" against Daesh -- telling the U.S. that one cannot use one terrorist group to fight another. In recent days Turkey has also criticized new U.S. observation posts in Syria, along the border with Turkey. On Wednesday, Erdogan said that within days Turkey would launch an operation in Syria, east of the Euphrates, near Turkey’s borders, to clear the region of PKK/YPG terrorists. That operation would follow two successful Turkish operations since 2016 to foil the formation of a “terror corridor” along Turkey’s border.